My Orange Brompton: Are some cylists becomming like some motorists? One observation about cycling to and from work on my Brompton is the fact that over the last 3 - 4 years the number of cyclists I see on my commute has steadily increased. This is great and will hopefully bring about greater investment in cycling infrastructure, allow many to follow a healthier lifestyle and have less impact on the environment, however are some cyclists becoming like some motorists? 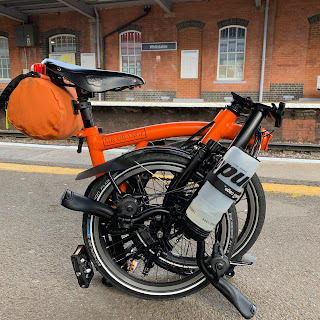 For me one of the joys of commuting to work on my Brompton is the fact I find it much more relaxing than being stuck in a car or pressed up to a nameless individuals armpit on a crowded bus, tube or train. This feeling is magnified on the way home where I feel able to unwind by the time I reach home. In addition the health benefits are definitely there and even though my commute is not huge, over a period of say six months I have saved money by not having to fill up the car as often. I would say that roughly once a month I witness some form of road rage. Tempers get the better of people and judgement and reason are abandoned for brief moments of madness, petty selfishness and a desire to not loose face. Such incidents are ugly and unnecessary. With the rise in the number of people taking to personal transport in the form a the bicycle - especially so during the recent train strikes - I have sadly noticed that some cyclists seem to be displaying the traits that some motorists exhibit, as described. I have seen cyclist shouting at pedestrians or other cyclists for not weaving through traffic. I have seen cyclists having stand up arguments with motorists for putting 30cm of their car into the cyclist waiting area. Worst of the lot were two grown men having a fight in the middle of the road due to one braking too hard and the other pilling into the back of him. There are also a sizeable number of lycra-clad roadies who seem to think they are participating in The Tour and ride in an overly aggressive and selfish way. Of course many of the above are possibly motorists too and perhaps drive / react in a similar fashion? Cycling in London can be stressful but you will probably get to where you want to go quicker and with less hassles than using public transport, without the need to take unnecessary risks or having little regard for your fellow road user. So before you hire a Boris Bike, buy a cheap mountain bike from Argos or spend a small fortune on a carbon number, just think what sort of cyclist you want to be? Remember the 7th rule for bicyclists; dont be annoyed when being passed by a Brompton.. The lycra guys are indeed causing dangerous situations now and then, but among fellow bicyclists worse I would say are meandering young ladies texting while biking with their ears plugged.